Wahu Beach Toys are designed by an Australian based company that has been providing fun for kids since 1999. The Wahu Company also supports many organisations that promote healthy kids. 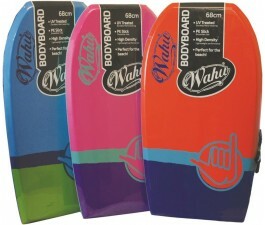 Our online toy store has an extensive collection of Wahu Beach Toys for outdoor recreation. We offer you a large selection of Wahu balls, such as the Wahu Footy and the Wahu Soccer Ball. We also have the very popular Wahu Swim Vests in assorted sizes and colours to keep your child safe in the water. Order today and make your next beach trip more fun with Wahu Beach Toys. Have a Blast with Wahu Pool Party Toys The perfect additions to any pool party are Wahu pool party toys. The company has been around since 1999 making all sorts of beach-related toys and other items. From swim vests to soccer balls, Wahu has always been about promoting a fun, healthy lifestyle, especially for kids. Not only does the company make great beach toys, it also provides a wide variety of toys and games to make any pool party an instant hit. Every pool needs a few Supa-Tubes, inflatable tubes that kids, or adults, can use to float around the pool. They come in a variety of colours and have two handles for easy use. Pool Ping Pong will be a big hit at your pool party. The table floats and comes with balls and two bats for hours of enjoyment. Skim’n Score is another great pool game which features a floating target and foam skimmers. 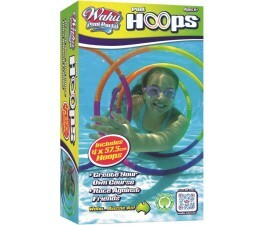 Wahu pool party toys include those for dive games as well. There are Dive Stix, Dive Rings, and Pool Hoops all of which are designed to sink to the bottom of a pool. Some of the best Wahu pool party toys are the inflatable ones. The pool slide inflates and then is placed right next to the pool for easy entry into the water. There is also a spray attachment that makes sliding even more fun. The Paddle Wheel, The Rocker, and The Eruptor are all inflatable toys that kids can play in and on for hours. All of the Wahu toys are designed for easy use and for ultimate fun!